This is the largest minor planet (and only dwarf planet) in the asteroid belt. It was discovered on 1 January 1801 by Giuseppe Piazzi in Palermo, Italy.. The minor planet was briefly named Cerere Ferdinandea, in honor of both the Roman goddess of agriculture and King Ferdinand, both considered by Italians of the time to be patrons of Sicily. Only the first part was widely accepted, of course. It was known by a few other names; in Germany, it was called Hera, and in Greece, it was Demeter. This body was originally considered a planet, and was assigned the symbol of a crescent on a cross by Piazzi. From 1802 until 2006 it was classified as an asteroid, until it was reclassified under the 2006 definition of a minor planet. 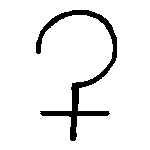 The symbol is a sickle, devised by Baron Franz Xavier von Zach , a fellow astronomer of Piazzi's. It is represented in Unicode as U+26B3, with the symbol ⚳. Comments are welcome on all posts, and I am open to criticism on each and every symbol.